Whether your goal is washboard abs, a six-pack, or just for your clothes to lay a little flatter on your stomach, the path to a trim and fit midsection is the same. But are mega amounts of crunches the answer? 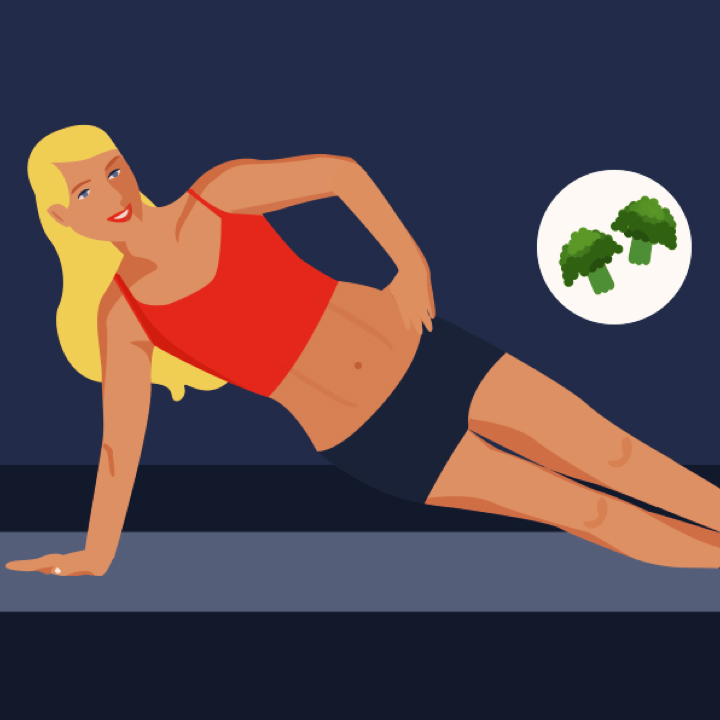 Read on to find out how food and exercise contribute to abdominal muscles. The best way to burn calories is to raise your heart rate – in most cases, that means moving your body briskly. It doesn't matter what you do or when you do it, as long as you’re moving and it’s brisk. You can choose the same activity every day, or change it up. Most of these can be done at home, but if you're a gym rat, cardiovascular machines including the elliptical, treadmill, stair machine, and rowing machine are perfect options as well. Shoot for 30 minutes of exercise per day. If you're already active for 30 minutes a day, up it to 45 minutes to work toward your ab goal. Researchers have studied which exercises activate ab muscles the most. 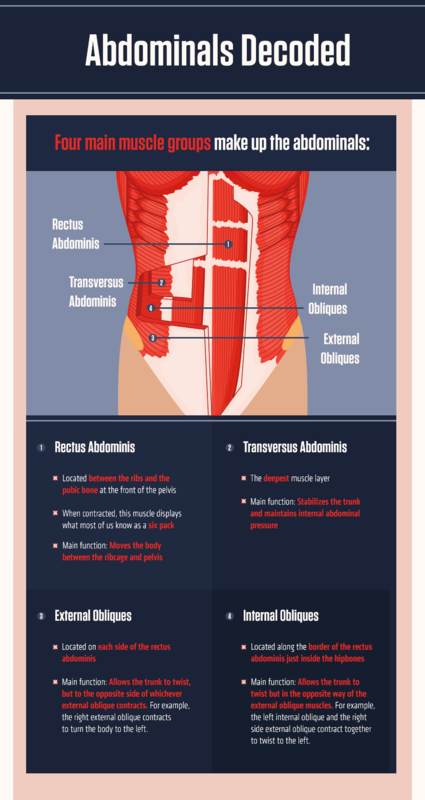 About a dozen years ago, a study sponsored by the American Council on Exercise compared 13 of the most common abdominal exercises, with some that used bodyweight only and others that used equipment (such as the Ab Roller and Ab Rocker).2 They ranked the exercises in order of how effectively they strengthened the rectus abdominus (the big muscle down the middle) and the obliques (the muscles on the sides that form the waist). The third best for rectus abdominus was crunches on an exercise ball, and reverse crunches for obliques. More recently, a study in the American College of Sports Medicine's Health & Fitness Journal revisited the same question, but updated the research by including activities that are more popular, such as yoga and Pilates. They also looked at deep muscle activity. Deep muscles are often referred to as the core and are important because they support the spine and lower body. An important part of getting fit and healthy is a healthy diet. To decrease any body fat that may overlay your abdominal muscles, you may choose to take in fewer calories than your body uses. But your body needs a bottom line amount of calories to function and to provide the energy needed to stay active. Here's a great tool to determine your daily calorie needs. While it’s good to have a general idea of how many calories you need each day, don't think you need to become obsessed with calorie counting. Focus on eating mainly moderate portions of whole grains, lean proteins, fruits, vegetables, and low-fat dairy foods most of the time. Limit your intake of processed, sugary foods and drinks and high-salt and high-fat snack foods, and reduce large portions. 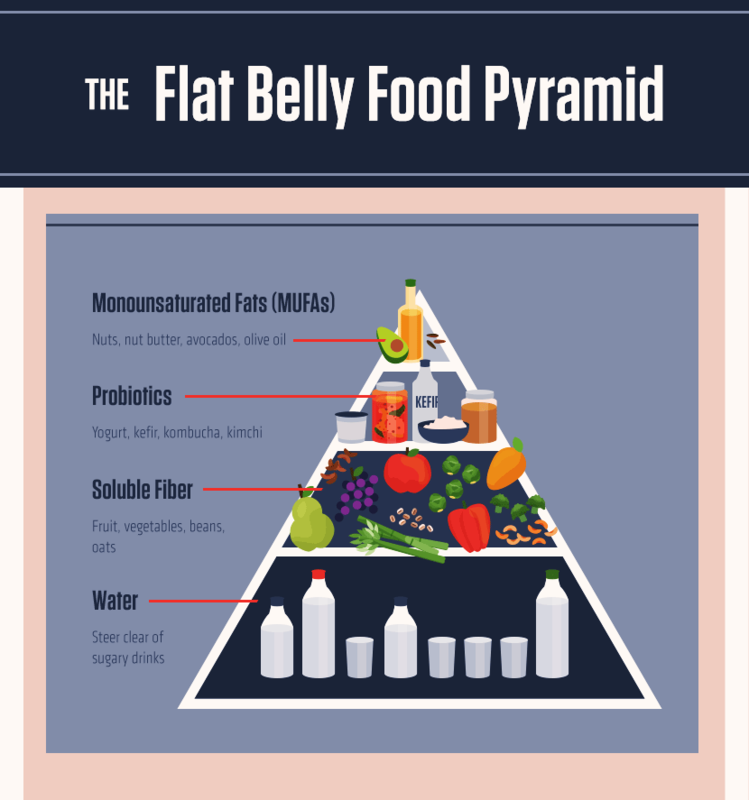 Monounsaturated Fats (MUFAs): Diets high in MUFAs have been linked to less belly fat accumulation. These include nuts, nut butter, avocados, and olive and canola oils. These are sources of healthy fats, but they are high in calories, so don't go overboard in your portion sizes. Water: Sugary drinks are usually nutritionally lacking but calorie-dense. Water is a great way to get the fluids you need and help prevent constipation, which can cause bloating. Plus, carbonation can trap tiny gas bubbles in your belly, which also contribute to bloating. For that reason, tap or fizz-free bottled water are better drink choices. Go ahead and flavor your water with cucumber or fruit if you prefer. Getting flatter abs is certainly an achievable goal. But you can't get them just by doing hundreds of crunches a day. The good news is that you can work toward your goal with a few simple exercises and a healthy, balanced diet.